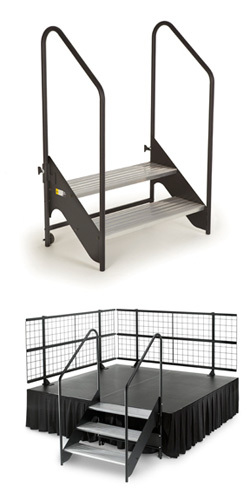 Wenger engineers have specially designed staging stairs to match Wenger staging versatility. Our 2-, 3-, or 4-step units are built with non-slip safety treads and permanent dual handrails for onstage safety. Steps are 39" by 11" (99 cm x 28 cm).